Team Announcement: Due to unexpected circumstances, Ivy McDaniel will not be going to the field this season with the research team. A thermokarst at Wolverine Lake, near Toolik Lake, Alaska. Photo by Lauren Watel. Tremendous stores of organic carbon frozen in permafrost soils have the potential to greatly increase the amount of carbon in the atmosphere. Permafrost soils may thaw sporadically and melting ground ice can cause land-surface sinking called "thermokarst failures". These failures change the rate and amount of carbon released with the unanticipated outcome being that soil carbon can be mixed-up from a depth and exposed to sunlight as the land surface is altered. Sunlight can photo-degrade or break-down organic carbon and alter the carbon's ability to support bacterial respiration to produce carbon dioxide. Whether sunlight and UV exposure will enhance or retard the conversion of newly exposed carbon to carbon dioxide is currently unknown—this study is providing the first evidence that this alteration will be amplified by photochemical processes and their effects on microbes. The research team is trying to understand exactly how sunlight and bacteria degrade dissolved organic matter by determining how fast these processes convert newly released dissolved organic matter to carbon dioxide, compared to dissolved organic matter already in surface waters. The team is accomplishing their research objectives with a series of laboratory experiments to determine rates of photodegradation and microbial processing of dissolved organic matter from different sources, and a series of landscape comparisons and sampling transects to characterize dissolved organic matter degradation in small basins and large rivers extending from the headwaters to the Arctic Ocean. Ultimately, this research will attempt to answer questions such as whether carbon export from tundra to oceans will rise or fall and how reactive the exported carbon will be. The team hopes to be able to measure the ultimate impact of impending disturbances, including climate change, on the net carbon balance of the Arctic and its interaction with the global carbon cycle. 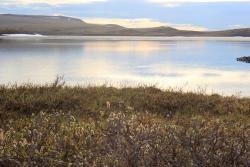 Toolik Lake in evening light. Photo by Regina Brinker. The research team was based out of Toolik Field Station, an 8-10 hour drive north from Fairbanks, Alaska. Toolik Field Station is operated by the Institute of Arctic Biology at the University of Alaska Fairbanks and has hosted hundreds of researchers and students every year since 1975. From the field station, the team traveled to their sites by foot, truck, boat and occasionally by helicopter. Ivy McDaniel is in her third year teaching biology and AP biology in the city of Chicago. In addition to teaching, Ivy also coaches the after school underwater robotics team. She holds a master's degree in science education from the University of Chicago, and a master's degree in molecular and cell biology from the University of California, Berkeley. Ivy is particularly focused on empowering students to take control of the classroom, and teaches science through a combination of open inquiry and student-led discussion of research. Ivy sees the classroom as the perfect place to exercise scientific thinking and practices, and can't wait to bring what she learns in the Arctic back to her students! Great video Ivy! It sure is dark in Alaska this time of year, isn't it? Ready for 24 hours of daylight when you go back? Wonderful post about winter in Fairbanks! I look forward to seeing the interview when I get to a place with a bit more bandwidth. I'm sure I'll learn a lot! Your video is super professional! It helps me understand about hibernation. Thank you!